Parts of Port Authority Bus Terminal were shut down Wednesday after a scare over white powder. Jummy Olabanji reports. A white cleaning substance strewn on the ground sparked a brief scare and partial shutdown at Port Authority Bus Terminal Wednesday morning before authorities deemed it non-hazardous within an hour. The NYPD says it received a call around 9 a.m. some suspicious powder outside the terminal. 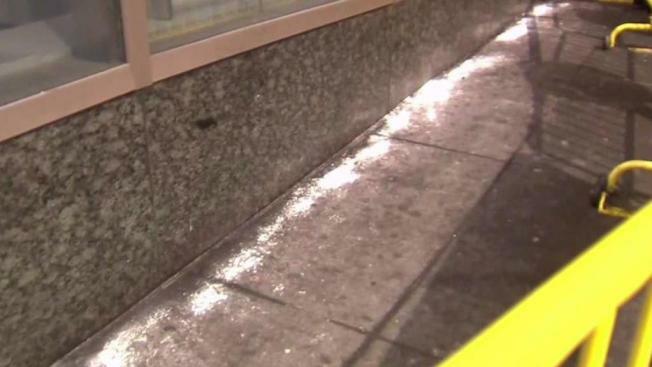 News 4 obtained a photo of some lines of powder next to the entrance, and shortly after 10 a.m., an NYPD spokesman tweeted, "The earlier suspicious substance at the Port Authority subway station has been deemed non-hazardous." The area was reopened to normal pedestrian traffic. Earlier, guardsmen were seen roping off exits and entrances and corralling commuters into a designated area inside the terminal as they investigated. The Eighth Avenue south pedestrian entrance was blocked for a time, as was subway access to the mezzanine level. Bus traffic into and out of the terminal was not affected, but the MTA reported its buses experienced delays in the area because of the police activity. Customers and workers at several nearby businesses say they were told to close up shop and get out. One man inside the terminal reported that he was taking refuge in a Starbucks and told that he "might be stuck here for awhile." The crowds seemed orderly, and the guardsmen appeared calm as they attended to the scene. At a separate crime statistics briefing later Wednesday afternoon, NYPD Deputy Commissioner of Intelligence and Counterterrorism John Miller told reporters, "It was a cleaning substance found on the stairs." The heavy emergency response took many back to last December, when police say 27-year-old Akayed Ullah set off a homemade pipe bomb in the busy transit hub, injuring five people and setting off panic during the morning commute. Some of the same officers who responded to that explosion helped direct commuters to safety Wednesday morning. "The people that serve New York, the policemen and security, are state of the art and world class," said witness Joshua Valentine. "I always feel safe with them." Just got shooed out of Port Authority by law enforcement, screaming “go that way!” No one was allowed to leave at the 8th ave exit. Saw some people in military gear as well.